Artist's concept of the Feb. 18, 2011, flyby of Saturn's moon Titan by NASA's Cassini spacecraft. NASA Cassini spacecraft in orbit around Saturn will take a close look at the ringed planet's magnetic field today (Feb. 18) during a flyby of its largest moon, Titan. 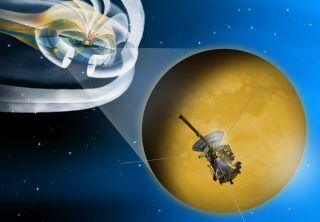 During the flyby, which will occur at 11:04 a.m. EST (1604 GMT), Cassini will study the interactions between Titan and Saturn's magnetosphere, a magnetic bubble that surrounds the entire planet, according to a NASA description. Previous flybys by the Cassini probe have revealed a rather tempestuous magnetic environment near Titan, one that is somewhat unpredictable, NASA scientists at the agency's Jet Propulsion Laboratory have said. This Titan flyby is valuable for probing Saturn's magnetosphere because of the location of the moon in its orbit. As Titan circles Saturn, the influence of sunlight and ionized gas inside the planet's magnetosphere changes, JPL officials said. "These factors are important for understanding the relationship between Titan and Saturn's magnetosphere," JPL officials explained. "It is important to make measurements at a variety of locations in the Saturn magnetosphere, so this flyby will occur in a part of the magnetosphere that has been poorly sampled so far." Cassini will study the ionized gas around Titan during the 12 hours immediately preceding closest approach, and then repeat the observations again after the flyby as Titan recedes in the background. But, Saturn's magnetosphere is not the only target for Cassini during today's flyby. The spacecraft will also use other science instruments to study Titan itself, including one tool that will take gravity measurements to probe the internal structure of the cloud-covered moon. "Collecting data like these will eventually enable scientists to determine whether Titan has an ocean under its crust," JPL officials said. Titan's northern hemisphere is also currently experiencing the spring season, with summer fast approaching. So Cassini mission scientists hope to use today's flyby to spot changes in Titan's weather system, track its hydrocarbon lakes, as well as monitor the clouds and particles in the moon's atmosphere, JPL officials said. NASA's Cassini spacecraft launched in 1996 and arrived at Saturn in 2004. It also carried the European Space Agency's Huygens lander, which landed on Titan soon after Cassini arrived in orbit around Saturn. The spacecraft completed its primary mission to explore Saturn, its rings and moons in 2008. Since then, the Cassini mission to Saturn has been extended twice, most recently to 2017.